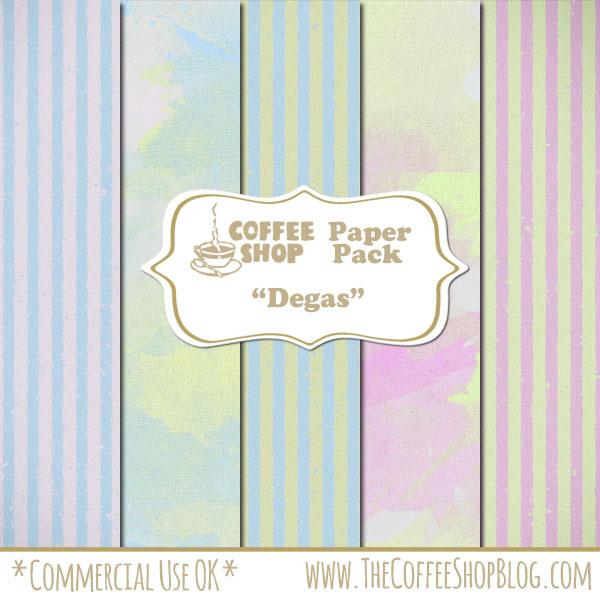 The CoffeeShop Blog: CoffeeShop "Degas" Digital Paper Pack! CoffeeShop "Degas" Digital Paper Pack! Today I have a really pretty "painted" digital paper set called "Degas". I created these papers from scratch with brushes and a striped pattern. I was going to write more today but a giant storm is about to hit so I need to turn off my computer. I hope everyone is having a great day!!!! Download the CoffeeShop "Degas" Digital Paper set. You can also download it here. Love the painted look! Thanks so much! Thanks for the papers and I hope the storm doesn't do too much damage to your area.